All good things come from above? Normally December 7, 2016 in Cambridgeshire in the south of England would have been a gray winter day like all the others. However, a small detail could include this date in a group with August 1888 and the October 1861 – when Bertha Benz undertook the first car trip and Philipp Reis presented the first telephone. On that day, Amazon delivered the first commercial delivery with a drone. Thus, the entry into a new age of the delivery technology should have succeeded. A step, which has not remained uncommented between frenetic jubilation and apocalyptic end-time prophecy, many opinions, were heard. Opinions, which unfortunately were rarely underlined with arguments. What is really to be expected of that, the droning technology of the future? Before this is about airspace monitoring in a moment, natural barriers and the German North Sea in autumn, go back to the beginnings. What happened in England on December 7th, and how did it happen? The development of drones for private and civilian use is mainly due to video flying. The maneuverable equipment is used to make aerial photographs of their own home, of an impressive natural landscape or the holiday resort. A quiet stand in the air and the ease of use predestine the drones for this. However, logistics companies saw far more than just this “playful” element of the use of drones. The compact airplanes cross almost every obstacle, are fast on the road, can even go independently with a smart programming – and they are able to transport packets. Amazon was one of the first companies worldwide to use this technology for delivery. After a comparatively short and intensive development phase, the “Prime Air” project was tested in England. The first consignment contained a TV box and a bag of popcorn and landed gently and undisturbed in the customer’s garden, which would have been able to pick up his package in a sleeping suit, if not curious cameras were pointed at him. The order was only took 13 minutes back then, even compared to the delivery the next morning, this is an enormous saving and shows a substantial potential of the drone logistics already. Fast delivery times are an advantage of drones, but not the only one. Therefore, the flight took place in England over two miles, which is about three kilometers, without pilots flying it. In this context, not a single person had to interfere with the flight of the autonomous drone on the ground. Monitoring alone was ensured of course. Against the backdrop of ever-increasing parcel numbers from the mail-order business, the aircraft represents a great aid to the emitters. For example, peak loads in the pre-Christmas period could be mitigated by threat-driven deliveries. Particularly interesting is the high flexibility of the small aircraft logistics. As long as employees are working in the distribution center, human assistance is needed for loading. – The flying package messenger can start at any time. This means that at least from morning to night at any time a delivery is possible, in the future even a 24-hour service is conceivable. This might be unnecessary for the popcorn bag, but it would be of great benefit in another area: urgent drugs would find their patients within a few minutes. Admittedly, this concept is still a future tale. A second example of the use of logistics drones, however, shows that it does not have to remain a fiction. When the summer tourists have gone and autumn is raging the North Sea, regular ferry and flight connections between the mainland and the islands are not self-evident. Previously, the situation was as follows: While the transit traffic is still, there is no exchange of goods. One problem is the supply of non-everyday goods, for example medication. The logistics company DHL wanted to end this malfunction. Thus, in cooperation with the municipality, the Luftwaffe and RWTH Aachen launched a pilot project for the island of Juist, which was established in the double word. On days when there was no ferry service, the “Paketkopter” should handle important deliveries. A special feature was that there was no visual contact between the “ground crew” and the drone on the approximately twelve kilometer-long route between Norddeich and Juist. The start, the flight and the landing were completely autonomous. This was achieved with each of the 40 missions completed by the drone between September and December. Twice, the island’s autonomous aviation community could help in emergencies. The project not only shows how drones can be used in the delivery process, but also provided valuable information for the further development of the technology. What does the drone transport of the future look like and does heaven sometimes turn us on the head? Is it now to be expected that drones will carry out in the future all messenger flights? Does the traditional mail carrier even become superfluous? No, the aircraft will take on additional tasks. This has several reasons. The drones of Amazon, DHL and other vendors currently reach payloads of about two to three kilograms. Accordingly, they can only be used for tasks where the packages do not exceed this total weight. This is not a problem for medication, blood tests or compact electronics, but the flat screen TV will not be able to fly through the air. In this respect, there is no danger that huge machines crash. In any case, the airworthiness of the drones is very high. If the charging level of the battery is low or if a different technical problem occurs, the flying transporter will immediately land. What can’t a drone do? It doesn’t speak and it doesn’t accept a signature. As a matter of principle, personal deliveries will continue to be distributed only by postal services. However, it doesn’t follow that a delivery by drone is uncertain. In the case of Amazon, a special platform is installed in the customers’ garden. The expensive delivery is therefore guaranteed to arrive at the right recipient and not in the front yard of the neighbor. DHL used Juist as a similar technology, here all packages were gathered in one place and accepted by one employee. The latter took over the final distribution. This leads directly to the question, why the messenger did not pick up the parcels directly in Norddeich – he did not want to swim or fly. 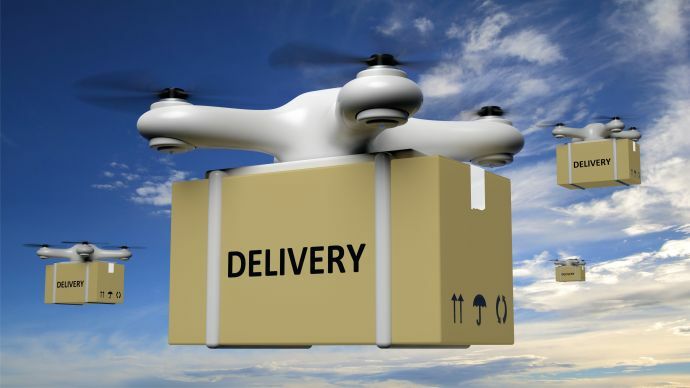 In fact, the division of tasks between man and aircraft can hardly be represented better: the drone takes over the transport via “natural barriers”, in this case the sea; man accepts the delivery and allocates the packages personally. As a rule, drones only take the last meters or kilometers of the delivery route. First, the range is not enough to fly a shipment from Munich to Hamburg, secondly, this would be very unprofitable, and since a drone, flight is expensive. Finally yet importantly, thousands of drones would have to fly through the air. The principle of drones logistics works differently. The goods are transported to decentralized warehouses; from there the aircraft starts to deliver. There is inevitably a problem, which follows from the previous working practice of the logistics companies. Usually the goods are stored in a central location and are dispatched from there. The drones would need stations in almost every city. An insoluble contradiction? No, solutions have long been found. In metropolises like Berlin, there is a sense of establishing decentralized stations. Amazon used a similar strategy for its first drone delivery: it was a low-cost container storage. In the future, such opportunities will be increasingly created in large cities. The experience of mail-order companies will show which goods are in demand at all, and they can be kept selectively in stock. UPS pursues a completely different approach to solutions for rural regions, which is also tested by other suppliers. 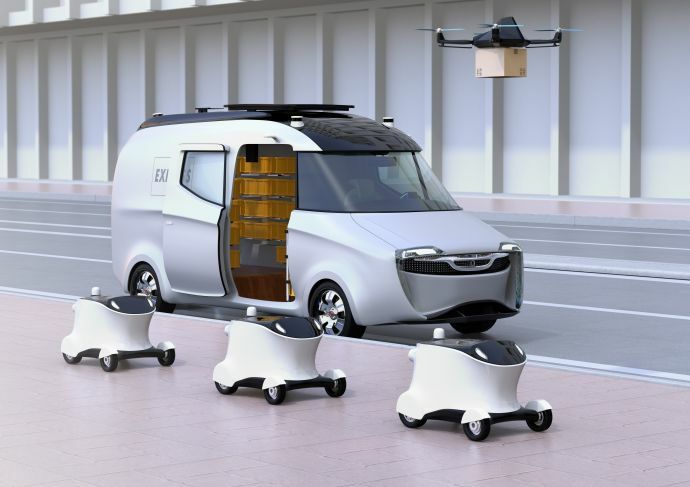 The American supplier uses vans as a starting ramp for drones. The pilots take over only the last meters from the van to the customer. The driver also provides packages at the same time – for example, those who are too heavy or have to be handed over personally. This idea is already using the advantages of drones in logistics. A solution that is likely to be used increasingly. The biggest criticisms of the drone logistics concern the alleged take-over of workplaces by machines and a possible threat to the airspace. 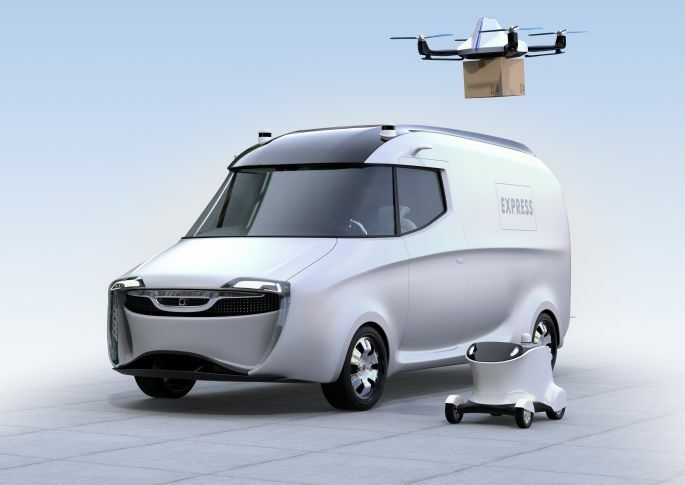 As far as the first aspect is concerned, it has already been explained in detail that there is no competition between the package deliverer with wings and those with legs – but a support of man through the technology. The problem of the increasing threat to airspace is due to two main reasons, which need to be addressed. There are still no clear regulations for drones in the airspace, even if the Federal Ministry of Transport has now responded and issued first regulations. From October 2017 onwards, pilots with proven knowledge – a requirement that has long been called for by active drone pilots, can only operate drones weighing more than two kilograms. In addition, criticism is continually being reinforced by news that links drone logistics with questionable targets. Therefore, some time ago the rumor took place, delivery services wanted to deliver their pizza in the future with autonomous mini-helicopters. An idea that has no future for financial reasons alone. Names such as DHL, UPS and Amazon show that research on meaningful and viable drone programs requires a financially strong investor. In terms of flight safety, measures could already be implemented with the corresponding funds, which were unimaginable ten years ago. Thanks to a 3D camera, the obstacles of drones are independently detected and flown, and the device is always informed of its own location by means of a GPS receiver, so that the software automatically maintains „flight zones“ over power stations or airports. The first successful tests prove that drones are a useful support for the logistics sector. The trends from the development show in which direction the help will go. In particular, the delivery of medicines, blood tests and light goods will be a task that is increasingly taken over by drones. In view of this potential, however, the policy is required to create clear frameworks for the use of unmanned airplanes. Even the safety requirements of customers require that all drones be clearly identified. Thus, the abuse of this technique can be stopped before it has begun at all. It is however a hurry. With innovative manufacturers and users, Germany is currently one of the leading nations in terms of the demand and use of drones. A tab that should not be abandoned by inertia in legislation.